The Buttermere Horseshoe comprises 6 Lakeland Peaks and is a high level circuit around arguably the finest valley in England with its summits in close configuration. This is a strenuous walk that presents no technical difficulties. It starts and ends at the village of Buttermere, which is situated on the shores of the lake with the same name. We start from the Buttermere Dubs footbridge and then take the stone stepped path through Burntness Wood and up to Bleaberry Tarn before climbing the path to The Saddle and ascending Red Pike. We then continue along the ridge taking in High Stile and High Crag before descending the steep slopes of Gamlin End to Scarth Gap where we start our ascent to the twin summits of Haystacks. From Haystacks the path descends past Innominate Tarn and Blackbeck Tarn affording a superb view towards Green Gable, Great Gable and the mighty summit of Scafell Pike. The very fit may want to detour here to take in the spectacular views from Fleetwith Pike. However, for normal beings, six peaks is usually enough for one day. Our route then follows the path to Honister Hause and the famous Honister Slate Mine where we cross the road before starting the long slog up to the summit of Dale Head. 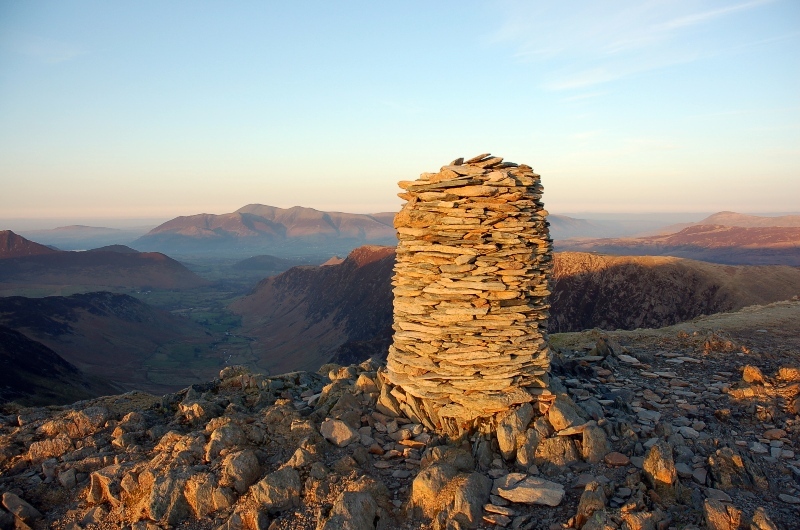 On a clear day there are stunning views from the delightfully crafted summit cairn at Dale Head towards Blencathra, Skiddaw and the fells around Newlands Valley. From Dale Head we now embark on the eastern leg of our circuit following the ridge path along Hindscarth Edge and the left hand path along Littledale Edge before veering right to the summit of Robinson - our final peak. The route back is then reasonably straightforward, traversing rough open moorland of High Snockrigg (which can offer spectacular sunset views over Red Pike) before starting out on a knee jarringly steep descent to the Newlands Road above the church. This is a tough high-level circuit of Buttermere that can be extended into a 7 Peak event. It is best done in the summer when the route includes spectacular views along its western leg including the High Stile Range and Haystacks and a spectacular sunset over Red Pike as you complete the eastern leg of the circuit. Arrive in the Lake District (pick up from Penrith Rail Station optional at extra cost) and spend an evening in Keswick at guest house accommodation. Have an early rise and get some breakfast at your accommodation. Head off in the minibus to the start of the walk and meet your guide. Spend the day climbing peaks around the beautiful Buttermere Valley. There are no dates currently scheduled for this activity. For latest availability and prices please contact us. We managed to complete the course in 9hrs; we all really enjoyed the day. Please pass our thanks on to [our guide] Craig for his patience and for putting up with our sense of humour all day. The accommodation was very good, Pam at Seven Oaks and Linda at Watendlath treated us well please feed this back to them.